Carnavaddy holds a special place in my heart, possibly because it was one of the first peaks I ever conquered, but more likely for the fact that I believe it provides one of the finest views in the Cooley mountains and can be part of a truly Legendary walk! Only one previous commentator has fleetingly referred to it, but this mountain plays an integral part in that most ancient of mountain sports, the poc fada. The yellow stones that many have mentioned, but none have explained, mark out the route of this great annual GAA event. The route starts in Annaverna, following the well marked track that features on the OS map up Clermont Cairn, before taking a sharp right turn to head for Carnavaddy. From here the route turns back down into the valley to form a triangular walk. The purists will no doubt pour scorn on this horrendous defacing of one of our hills. In this instance I think it can be justified, as they mark out the playground that Cuchullain himself once played in! They do effectively act as a way marking which I myself have followed in thick fog (Note: I will still always have map, compass and gps with me in case I somehow got lost). My favourite route for this hill starts with parking up at J09410 13490 A. There is room for about three cars here, there has been a DNG sign outside this house for well over a year now, look out for it. From here you head for the track in front of you that goes over a small concrete bridge, you will cross a gate after about 200 metres before starting the ascent along a track to the right of a stone wall. 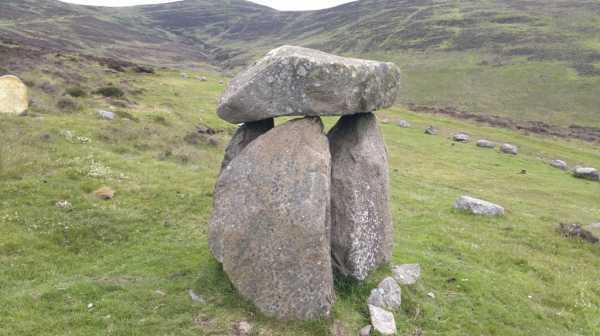 As you rise you will notice a stream in a deep gully to your right and stone alignments in front of you with the smallest damn Dolmen I have ever seen! The area is worth a look, so head over and investigate. From here you are looking out for the yellow stones heading off in a south easterly direction, which you follow all the way to the summit. The route crosses a couple of gullies, the largest of which poses the entrants to the poc fada the particular quandary of lay up short, or try and carry it! Once at the summit I will usually head for Clermont Cairn before following the track back down to Annaverna. I have covered this route in 2 hours 20 when travelling at a very strong pace, but 3 hours would be the average time for this anti clockwise reverse circuit of the poc fada.